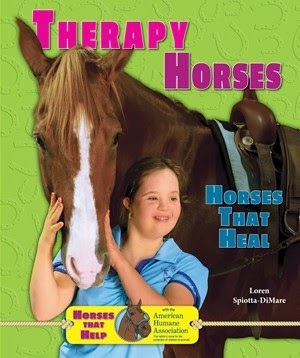 Therapy Horses: Horses that Heal by author Loren Spiotta-DiMare explains how incredibly helpful a therapy horse can be to a teenager with special needs. Read about the history of therapy horses and how these amazing animals help people with physical and emotional challenges. Available in hardcover, paperback, and ebook from Enslow Publishers, Inc.
Get to Know Cat, Dog, and Horse Breeds is a series of three titles, with each 128+ page title focusing on a different animal. Each title features detailed descriptions of different internationally recognized breeds. These titles are a great page length for the middle school student. For those that are cat lovers, have you ever heard of the Neva Masquerade? The FIFe (Fédération International Féline) considers this as part of the same breed as the colorpoint Siberian, and not in its own category. How about the Sokoke? This cat is found in the Arabuko-Sokoke rain forest in Kenya. Have you ever heard of the Polish Tatra Shepherd? This white shepherd breed is closely related to the Great Pyrenees. How about the Entlebuch Cattle Dog and Appenzell Cattle Dog? These breeds were named after their places of origin in Switzerland. Read about a lot more of these lesser known breeds in the Dogs book. The Horse title goes into detail about a lot of lesser known breeds of horses usually found in the United States. Does the breed Akhal-Teke sound familiar? Thought to be one of the oldest horse breeds in the world, the origin of this breed is from Central Asia. The Berber originated in North Africa. There are only a few purebred Berbers left. Many Berbers have been crossbred with Arabians. All of these titles are available from your preferred vendor, enslow.com, local bookstores, Amazon, and Barnes and Noble. They are available in both library and paperback editions. Loren Spiotta-DiMare's new four book series, Horses That Help with the American Human Association, has received a great write up in this month's Horse News. The article has an provides an in-depth view of Loren's experience writing the series and talks about many of the working horses and their trainers that appear in each of the 4 titles. The article appears on page 19 of the January 2014 Horse News. Titles in the Horses That Help with the American Humane Association series are available in Library, Paperback, and eBook editions. Please visit Enslow.com for more information.